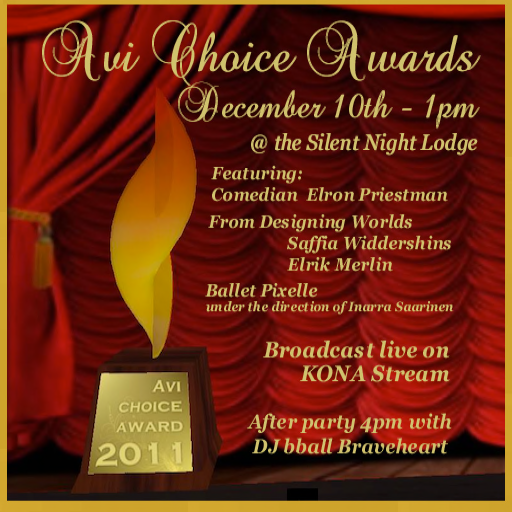 the Silent Night Lodge housed the first Avi Choice Awards in 2011. This magnicent structure was built by Kayle Matzerath of Garden of Dreams. 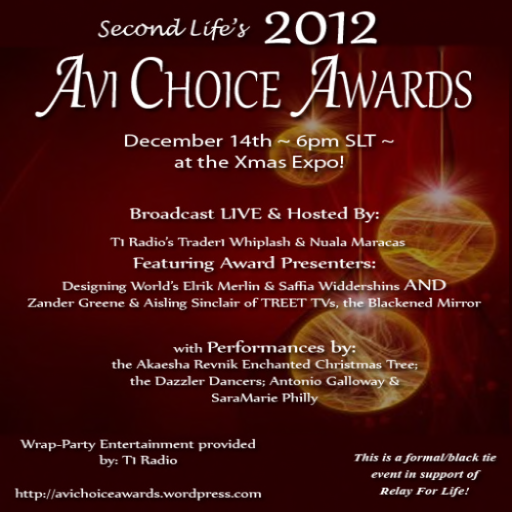 Founded in 2011 by Nikki Mathieson, the 1st Avi Choice Awards was held in the Silent Night Lodge at the Xmas Expo. The lodge was built by the FABULOUS Kayle Matzerath of Garden of Dreams. The show was produced by Shayla Juran and Nikki Mathieson and hosted by Aisling Sinclair and T1 Radio. Presenters were: Saffia Widdershins & Elrik Merlin of Designing Worlds TV Show, followed by MamaP Beerbaum and Dwen Dooley of Relay For Life of Second Life. Performances included : Dance of the Sugar Plum Fairy an excerpt from Ballet Pixelle’s The Nut and Comedian Elron Priestman. 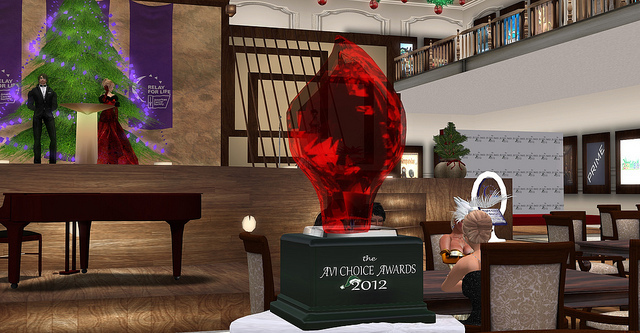 Click here to see the list of Avi Choice recipients from 2011.
the 2012 Avi Choice Awards took place in a beautiful auditorium constructed by Harlequin Phang. Two sims filled up with eager attendees all dressed up in the SL BEST fashion! 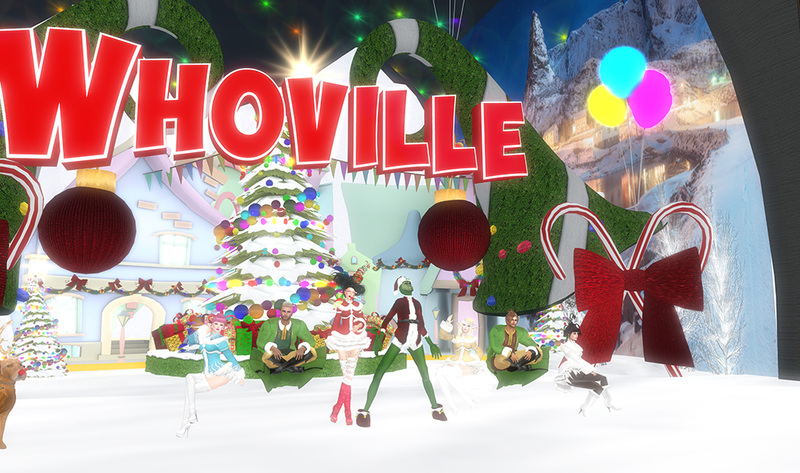 The 2nd annual Avi Choice Awards returned to the Xmas Expo in 2012 in a beautiful build set in the center of an amazing winter wonderland park and spread over the corners of two sims. The build was constructed by Harlequin Phang with assistance from Nephelle Lanate. the popular little trophy has evolved over the years. Pictured is the 2012 Avi Choice trophy. The show was produced by Nikki Mathieson. Director Angie Mornington was joined by Hosts, Trader Whiplash and Nuala Maracas of T1 Radio, Presenters, Saffia Widdershins and Elrik Merlin of Designing Worlds TREET TV Show and Aisling Sinclair and Zander Greene of The Blackened Mirror TREET TV Show. Performances were enjoyed from Antonio Galloway, SaraMarie Philly and the Dazzlers dancers under the direction of Pyper Dollinger. 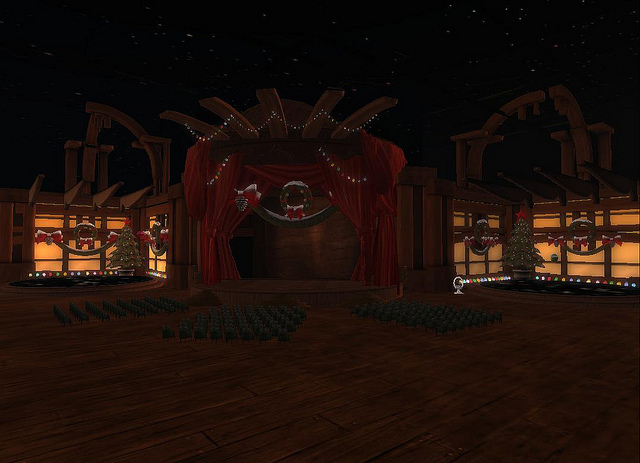 Added to the show was a musical Christmas Tree light show provided by Akaesha Revnik. Click here to see the list of Avi Choice recipients from 2012. Audience members seated and ready for the beginning of the 2013 Avi Choice Awards. Every seat in the house was filled and what a show it was! The awards were held in a beautiful venue built by Wayne Bentley of Bentley Homes…an extra large event called for an extra large build with both style and functionality. 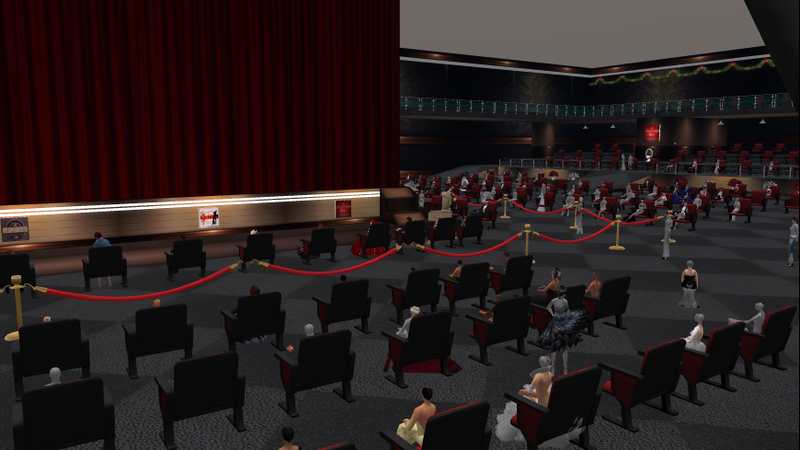 The 3rd Annual Avi Choice Awards was set in two identical auditoriums placed between four sims to accommodate the crowd who looked forward to attend an event that had now grown so much. The spectacular auditorium was constructed for the very special and prestigious occasion by the very talented Wayne Bentley of Bentley Homes. AView TV (LaPiscean Liberty, Petlove Petshop, Secret Rage, Geo Meek, Malburns Writer and Emmo Wei) jumped onboard and provided live video coverage along with HUDs that allowed everyone to have a front row seat. They reported 700 viewers to their video coverage alone, More than 400 tickets were distributed to those who wanted to attend in avi-person. Nominees and votes poured into the Avi Choice website and it was then that the founder of Avi Choice looked more carefully, more tenderly and with a new respect and understanding that the residents of Second Life have spoken and love the Avi Choice opportunity. steven Onskan, Chicagosax and wdgroupie). Click here to see the list of Avi Choice recipients from 2013. 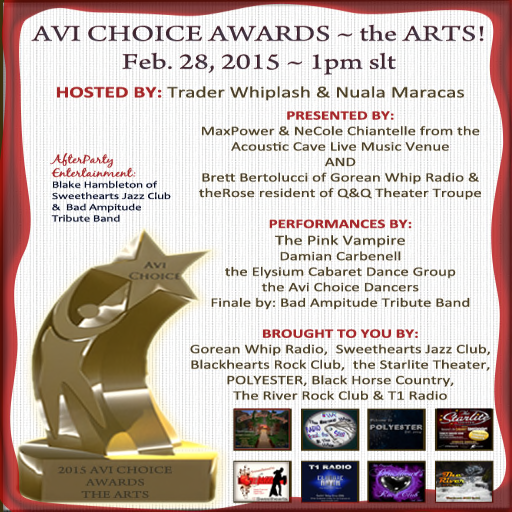 In 2014 the Avi Choice Awards moved to a new theater called the Avi Choice Variety Hall. It was set on two of it’s own sims. 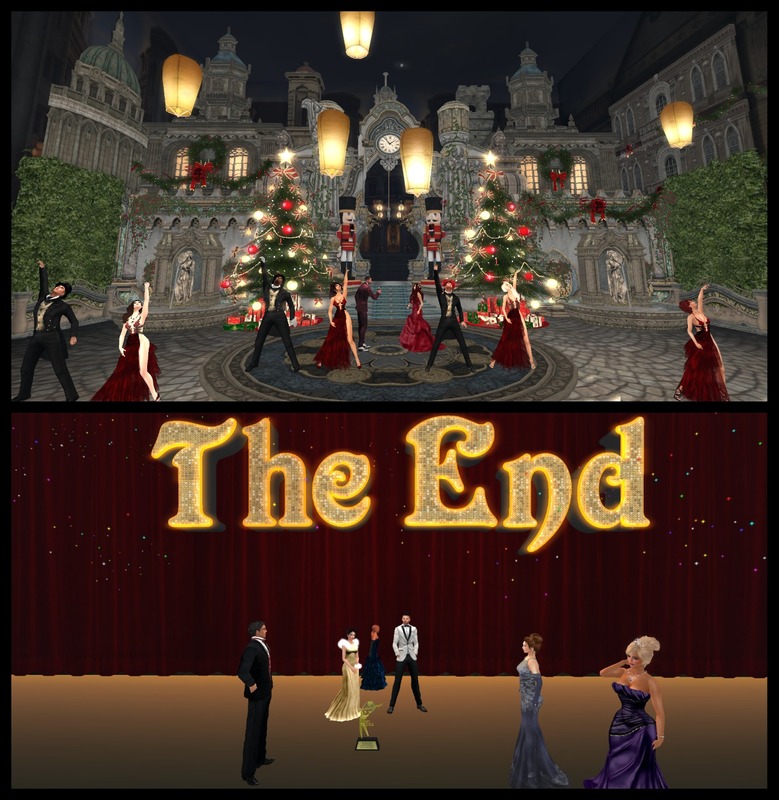 No longer a part of another signature event but on it’s own, yet still in support of Relay For Life of Second Life. The amazing new auditorium was mesh constructed and the incredible builder/designer Dextresis Dejavu had joined the Avi Choice team. She designed a brand new trophy for all the Avi Choice winners and nominees both. This was the year that the Avi’s were split up into three shows a year, covering areas in the community more thoroughly based on multiple requests over the previous years. Beginning in the winter of 2014, there would be a separate awards show for each of the area categories: Fashion, the Arts and SLife. December 2014 the Fashion Awards were presented to a PACKED Variety Hall and again hosted by T1 Radio’s Trader Whiplash and Nuala Maracas. Joining them were presenters Saffia Widdershins and Elrik Merlin and Sofia Diage with Frolic Mills. 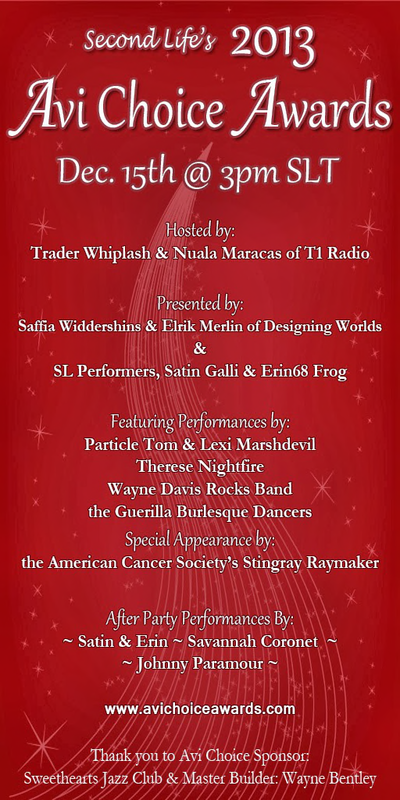 Performers included Chillee Hernandoz, Hammerfla Magic, the Spirit Light Dance company and the ReAct Christmas Tree. 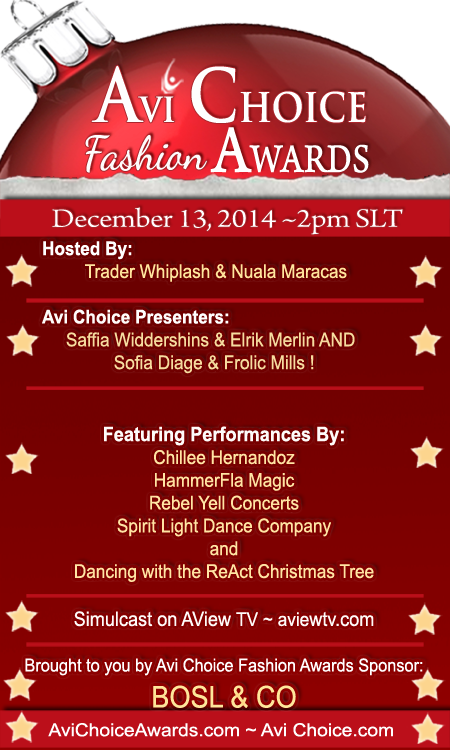 Click here to see a list of the 2014 Avi Choice FASHION Awards winners! 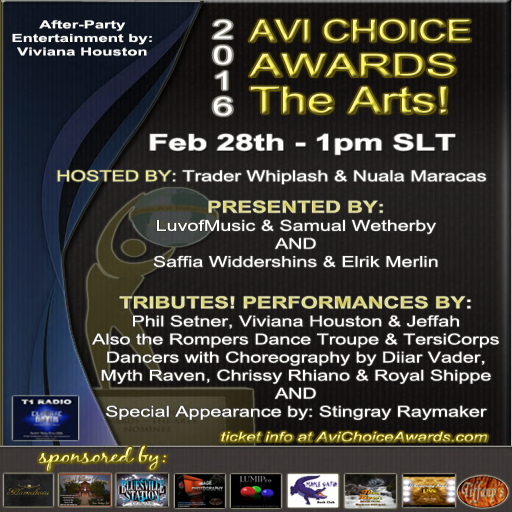 In February 2015 the Avi Choice Awards – the Arts took place and for the first time many more artists and performers were applauded than ever before. Tickets sold out FAST and the sims were pushed to capacity. Returning to host for a fourth year was T1 radio’s Trader Whiplash and Nuala Maracas. Presenting awards was MaxPower Godric and NeCole Chiantelle and Brett Bertolucci with the Rose resident. Performances by The Pink Vampire, Damian Carbenell, the Elysium Cabaret dance troupe, the Avi Choice dancers and a finale by Bad Ampitude Tribute Band provided the packed auditorium with an amazing show. Click here to see the list of winners and sponsors for the 2015 Arts Awards and to watch the video, click HERE. June 2015, the first SLife Awards was held and once again, tickets were sold out by day two of sales. Nominations and voting reached an all time high and the show was amazing. Trader Whiplash and Nuala Maracas returned to host the show while Saffia Widdershins and Elrik Merlin also returned as presenters. Brett Bertolucci also returned as presenter and this time was joined by Jay Sparrowtree. Performers included Savannah Coronet, the Winds of the Sahara Dancers, Idle Rogue Le Cirque de Nuit with choreographer Setsuna Hirano and the grand finale was performed by MichaelJackson Follette. 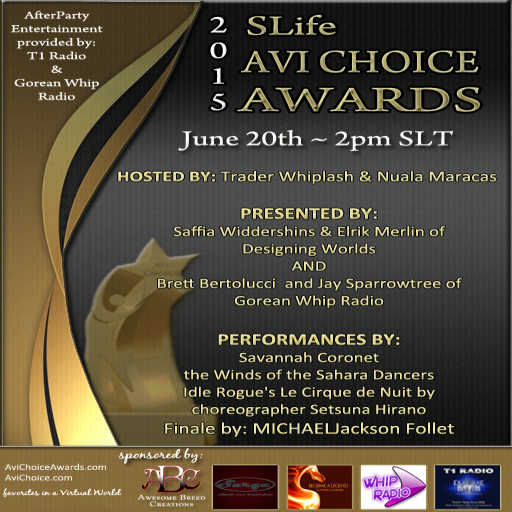 Click here to see the full list of Avi Choice voted favorites. The 2015 Fashion Awards held during the Holidays set the scene for another festive and fantastic show. Another record was set in nominations submitted and in votes cast. Tickets sold out again and the sim filled to capacity. Trader Whiplash and Nuala Maracas hosted the Awards show while Blake and Shannon Bramlington Hambleton presented as well as Relay For Life’s Stingray Raymaker and Random Padar Darrow. 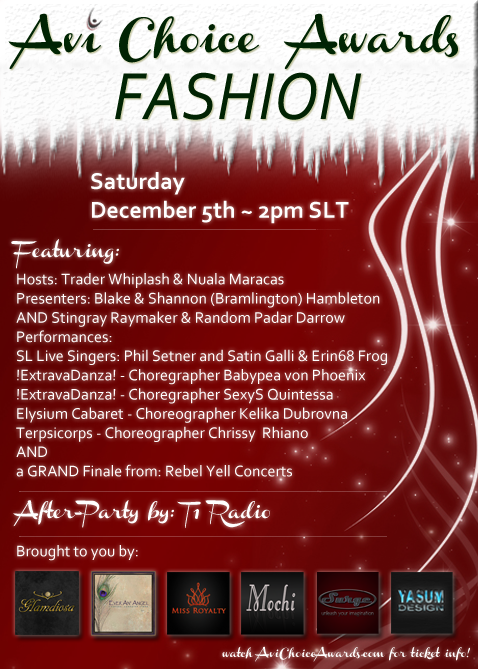 Performers included Phil Setner, Satin Galli and Erin Frog .. songs from Extravadanza choreographers, babypeavonphoenix and sexys Quintessia, along with Tersi Corps dancers choregraphed by Chrissy Rhiano and Elysium choreographer Kelika Dubrovna with an amazing finale by Rebel Yell concerts. Click here for a full list of the resident’s choice for these Fashion Awards. After announcing, at the 2015 Fashion Awards, that the Avi Choice Awards, as they currently were (People’s Choice nominating and voting) were coming to a close. There were two more Awards shows held in 2016. The first one was celebrating the Arts and was held in February 2016, with plans to do two more awards shows following. 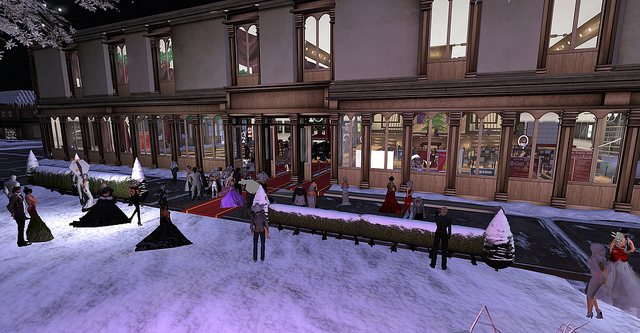 The Arts awards was held again in the fabulous Avi Choice Variety Hall with Trader Whiplash and Nuala Maracas hosting. Presenters included LovofMusic and Samual Wetherby and returning for a sixth year as presenters were Saffia Widdershins and Elrik Merlin. For the only time in the history of the Avi’s there was a theme. 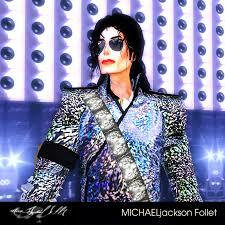 A tribute to the many much loved performers we love outside of SL. Performances were just stunning and those who contributed to this awesome show were Phil Setner, Viviana Houston, Jeffah with dancer choreography and set design by Diiar Vader, Myth Raven, Chrissy Rhiano and Royal Shippe who brought amazing dancers from the Rompers Dance Troupe and TersiCorps to the Avi Choice stage. Also part of this production was a fantastic dedication and introduction to the finale tribute to David Bowie. 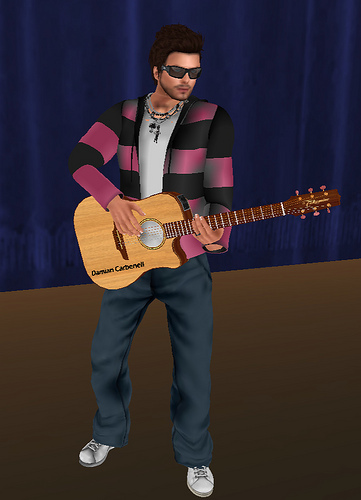 The intro was done by Relay For Life of Second Life’s, Stingray Raymaker. Check out that video here. To view a complete list of the Arts 2016 winners, please visit this link. 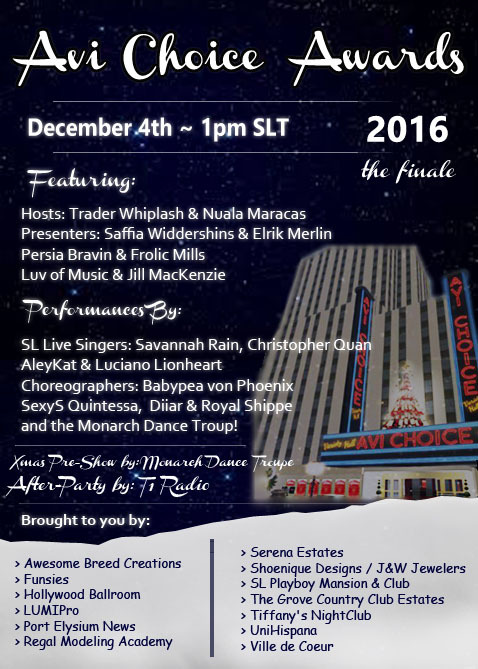 The Avi Choice Awards Finale took place on Dec 4th, 2016 and celebrated favorites in all three genres… SLife, Fashion and the Arts. 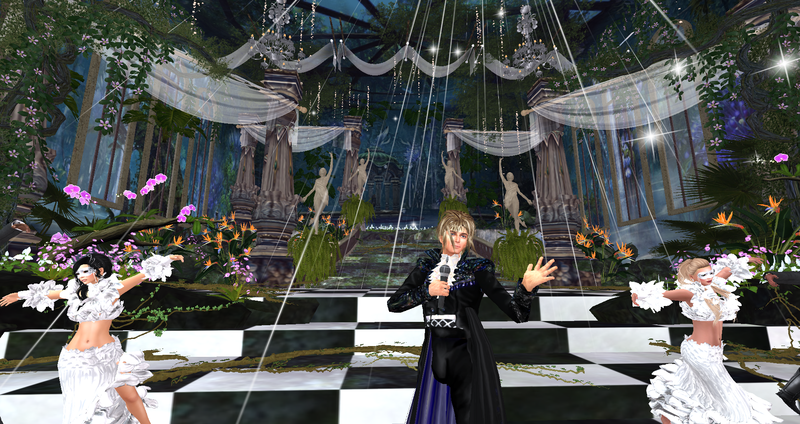 An amazing show was held and featured hosts Trader Whiplash, Nuala Maracas and presenters Saffia Widdershins, Elrik Merlin, Persia Bravin, Jill MacKenzie and LuvofMusic. Fabulous entertainment was provided by Savannah Rain, Christopher Joel Thompson, AleyKat, Luciano Lionheart with dance choreography provided by babypeavonphoenix bikrgrll, Sexys Quintessia, Diaar Vader Shippe and Royal Shippe with dancers from the Monarchs Dance Troupe. Awards were presented in an unprecedented list of 98 categories. For the list of the finale Award recipients, please click HERE. To watch the video of this finale, click HERE.